Our last evening of our mini-vacation, and we went to go see Star Wars - Episode VIII: the Last Jedi. The plan was to see it with our friends, David & James. Maybe we still will, but chances are, I will suggest another movie. James has only seen Episode IV and VII .....and Rouge One. He's not invested. I'll do this without spoilers, if I can. I'd say the key to this movie is Luke, but I'm not so sure that is the case. It was a great lead-in with the ending of the Force Awakens. He does tell Rey regarding her plans, "this isn't going to go the way you think". The same could be said to the audience. There are a lot of storylines going on here. Enough so that I kept thinking the movie should be ending, but then I forgot another part still needed to be wrapped up. I like the story. I'm not sure I love the entire execution of it all. Oddly, you expect Luke to be the heart of this movie. And while he does that to a certain extent, the real heart is a newcomer, Rose. ....and with Finn and Rey in different worlds - literally - with the appearance of Rose, Finn would have to change his Facebook status to "it's complicated". Hamill is pretty good in the elder statesmen / recluse role. For all intents and purposes, he has become Ben Kenobi. Like Ben, he tries to train Rey in the ways of the Jedi. Normally that would be fine, except for the fact the filmmakers just got to Lesson #1 on being a Jedi and Rey totally nails it. Like, immediately. There isn't even a learning curve to jump to what the Force is and how it works. It's Evelyn Wood of Jedi Schooling. I get it, time was of the essence. I am not sure if Kylo Ren is actually conflicted or if Adam Driver is just a one-note actor and can't fully portray the character. I can't be the only one who thought he was just yelling at Hanna Horvath instead of Rey, right? There is no nuance to his performance(s). The director does decent things crossing space and time with Kylo and Rey, which I thought was clever. I think Daisy Ridley, John Boyega and Oscar Issacs do fine jobs, especially Ridley. But I'd rather just look at Oscar for 2+ hours. Partially, the story isn't all new, but it's not over-the-top rehash like the Force Awakens. You certainly get the Ben Kenobi (i.e. now Luke) recluse thing like IV. You get the training I mentioned - though it's not quite done with the same tone as a New Hope. Yes, there is the Empire and the Rebellion....sorry, the First Order and the Resistance. 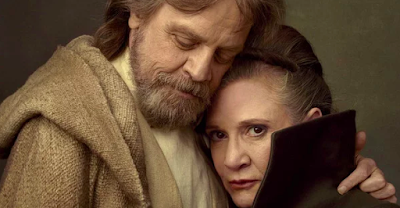 You have the Sith and his apprentice (and seriously, is there no one in Hollywood willing to do motion capture that isn't Andy Serkis?). ....and you have trade wars. Which sounds familiar, though not as CSPAN-y as the galactic senate in episodes I-III. Still, the casino scene is something more out of a James Bond movie, and didn't seen true to this series. There are two newcomers here (well, other than Rose): Laura Dern and Benicio Del Toro. Before the movie, I was torn on the additions. Pseudo-big names, but were they needed - the actors, not the characters? They could have been played by anyone, though I will say, as did Luke, "this isn't going to go the way you think". I was mildly surprised on a few fronts - especially with Dern, who ends up doing something, now that I've seen it, that I cannot believe had not been done in any prior films. Like the elephant in the room, regardless of what may or may not happen to General Organa (Princess Leia to you! ), is right there for the entire film. Carrie Fisher's death was palpable during the entire movie. How could it not? Fisher does a good job too, and I don't think I'm cutting her slack due to that being dead thing. Brother and sister have a nice scene together. I will applaud Rain Johnson (writer and director) for not taking some of the predictable ways out of certain story elements. As it was stated, didn't go the way we (might have) thought, though I am pretty sure I rolled my eyes when someone in the First Order just had to say "rebel scum'. Two additional things bothered me too. In the opening moments of the Force Awakens, the rebel alliance hurries to get Max von Sydow out of harm's way. I assumed there'd be a story behind him later in that movie, or maybe in this one. There was not. Just a dead end. Yes, it's two years later and I'm still dwelling on a minor event. Are you surprised? If so, you have not been paying attention the last 14 years. The other thing that grinds my gears - and it's not just with this movie - "the grudge". The villain who must go after the good guy at all costs.......no matter what is going on around them. Buildings blowing up, girders falling down around them, infernos all around, planes out of control plummeting to the ground at breakneck speed.......yet they still need to pursue the 'hero' to cause their demise. You've seen it in Bourne, Bond, and just about every other action flick in the world. Now you get to see it in the Last Jedi. It's a tried and true filmmaking 201 maneuver and it never ever ever ends well for the villain, so why do it? Be better than that! In Jedi, it's a meaningless segment, but it extends the movie, which isn't needed since it already clocks in at 2.5 hours (though I will say, it did not feel that long). I would say the Last Jedi ranks in the top third of the Star Wars movies. ....and that ain't nothing. My final thought: Porgs are way better than Ewoks. I've never been a fan of the S.W. films, though I've seen every one. Last year I vowed that henceforth I was going to quit my annual routine as they just grate on me - BUT now comes an oppo to see it at reduced price at a 10.30 a.m. screening - in just two hours time. Nearly all critics are giving this one wall-to-wall 'oohs' and 'aahs', and that, coupled with your own certificate of approval, and I find myself thinking......"Well, why not?" So here goes! Btw: I only wish Mr Isaac would have occasion to wear that fuzzy beard again which he did for 'Ex Machina'. OMG, 'twas incred! Now if he did THAT I'd be down there like a shot, first screening no matter what the price was. Can’t read. I will see after my recovery when I am able to drive again. Hopefully next week.